Compact FT-817 & FT-817ND Mini-Manual. Single Mini-manual supports both FT-817 models. Size, 4.5x8 inches. 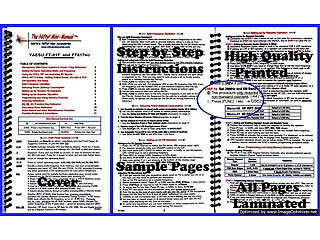 Twelve high-quality laminated pages, loaded with detailed instructions. Ideal for setting-up and operating this amazing portable all-mode radio. Fits in The Pouch. Click Photo at left for Large Image of Mini-Manual pages.